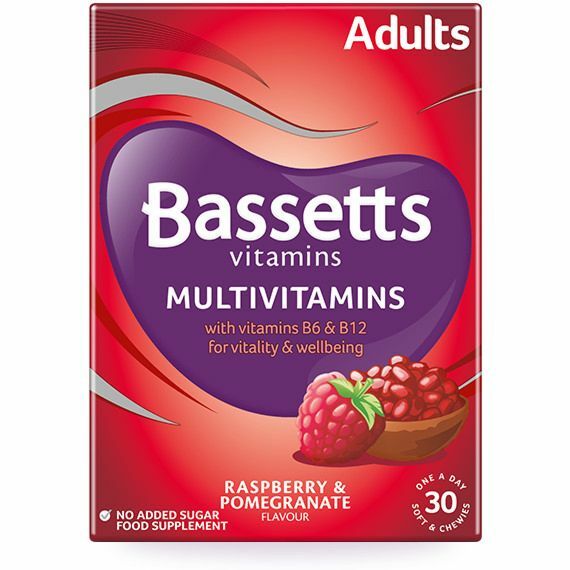 What are Bassetts Raspberry & Pomegranate Flavour Multivitamins? Bassetts Raspberry & Pomegranate Flavour Multivitamins are a one a day soft and chewy multivitamin. With natural flavours and colours, they're free from nasty chemicals. These chewy sugar free pastilles are a great way to make sure you get your recommended daily intake. Sweeteners (Maltitol, Sorbitol, Sucralose), Gelatine (Bovine), Vitamin C, Vitamin E, Colour (Anthocyanin), Acid (Malic Acid), Raspberry Flavouring, Glazing Agent [Vegetable Oil (Coconut Oil, Pal, Kernel Oil, Sunflower Oil), Carnauba Wax], Riboflavin (Vitamin B2), Vitamin A, Vitamin B6, Pomegranate Flavouring, Vitamin D, Vitamin B12.